♫ School is Almost Out – Don’t Quit Yet! My birthday is October 17. There are two things that always come to mind on this date. The first is that I am another year older. That is obvious to me every day. The waist inevitably expands, and I vow to start doing twenty-five sit ups and twenty-five crunches every day. I’ll make the same vow next year, I’m almost sure. I look in the mirror and see a few more grey hairs, or the fact that there are fewer hairs atop the head today than there were yesterday. I vow to look into some dye, at least for the moustache. I view the expanded forehead as a sign that wisdom and knowledge are expanding. My 14-year old daughter, Adriana, would take issue with that. The second thing that comes to mind is that Christmas is on its way. 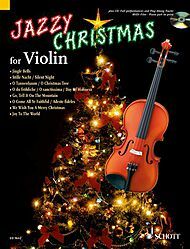 If I am going to play my violin during the Holiday Season I need to get to work on some Holiday music. It’s time to start researching what is available and to start making decisions as to what I will play. This year I think I’m going to look for some fun stuff to play rather than just (in the words of my daughter) “churchy, serious” stuff. This entry was posted on October 20, 2010 at 12:18 pm and is filed under Uncategorized. You can follow any responses to this entry through the RSS 2.0 feed. You can leave a response, or trackback from your own site.